After two or so years of asparagus curiosity, Joe and I have planted a row of Purple Passion Asparagus. Asparagus should be planted in this region from mid-February to early-March, so we were about a week late. After reading about optimum planting methods, we tried to stick to those but budged on the dimensions of the trench and had not prepared the soil a year in advance. 1. Joe dug a 25' long trench that was about 8" deep (give or take a few in places) and about 8" wide. Ideal width is closer to 12", but one man (recovering from a sulfa drug reaction) with a shovel a pregnant lady with a tape measure and a bossy pointer finger can only handle so much digging. 2. 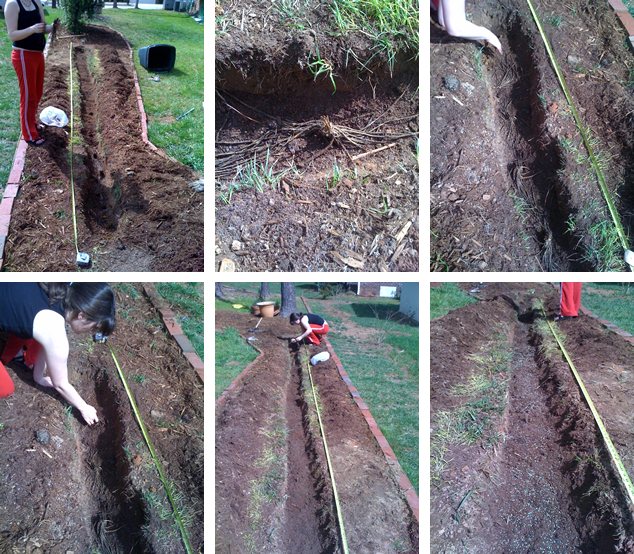 We covered the bottom of the trench with some of my soil mix from the veggie bed. Mix included soil, Black Kow, Black Hen, and a lot of peat. 3. I spread out the roots of each pre-soaked crown with the buds facing up along the trench floor at a 12" on-center spacing. 4. Joe topped with another inch or two of the soil mixture until the crowns and buds were fully covered. 5. I sprinkled some "Shake and Feed" down the trench length according to the package directions and then gently soaked the trench with water. 6. As the crowns sprout, we will continue to cover with the soil mixture until the trench is level with the ground and then top with mulch. Purple asparagus spears are slightly larger than their green brothers and sister, are the most tender and have been claimed to be slightly sweeter. When cooked, the purple turns to green. Spacing plants closer yields smaller spears (personally, I like the skinny ones better than the thick ones). Asparagus plants shouldn't be harvested for three years. My two year crowns won't be harvested next year, but the following year. Allowing them to flower next year will help develop strong plants. While this will take some patience for me, these plants could give me yields for 15 - 25 years. Haha - I suffer from the bossy pointer finger as well. Good luck on the asparagus! You've got a lot of patience - Me, not so much... but if your asparagus does well, it may inspire me to try it someday! What a labor of love. You're going to treasure that first crop!